Rajmohan Gandhi's book on Mahatma Gandhi has created a controversy mainly because one of the chapters is devoted to Gandhiji's relations with Saraladevi Choudharani whom he called his spiritual wife. Girja Kumar gives a more vivid characterisation of this relationship in his book which was released last year. This book, in fact, gives an authentic account of the Mahatma's relations with various other women associates and the repercussions these romantic liaisons produced on those close to him, including 'Ba' (Kasturba Gandhi). The book is ready to go into reprint and the paperback edition will shortly hit the stands. A Hindi edition is also coming up. Born in 1925 at Dera Ghazi Khan (Pakistan), Girja Kumar is a veteran research scholar. The man behind the Sapru House library, he has held many important positions including Chairman of the Delhi Library Board (1985-86) and President of the Indian Library Association (1983-85). He was Associate, Oriental Division, Library of Congress, Washington DC during 1954-55. He retired as chief librarian of the Jawaharlal Nehru University library in 1985. His world has been a world of books. While he wrote books on censorship and education, he always contemplated producing a book on the greatest cult figure of modem times – Mahatma Gandhi. 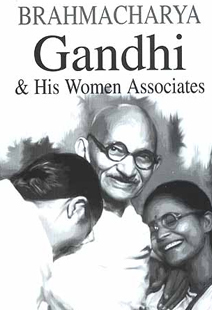 Brahmacharya, Gandhi and His Women Associates is based on extensive research and quotes of the main players while delineating the Mahatma’s relationship with his women associates. The present book, in that sense, is a biography within a biography. Girja Kumar was associated as a book critic with several national publications and wrote regularly for The Indian Express (1975-79) and The Week (1984-87). He has published a definitive biography of world-renowned librarian Dr S R Ranganathan, besides publishing an innovative work on the ‘arrogance of intellectual power’. His The Book on Trial, Fundamentalism and Censorship in India was widely acclaimed.